Want a real oldtime brew? Try hoisting a Spartan Barley, produced from a 100-year-old seed that has been in a gene bank since Prohibition. Century-old Spartan barley has made a comeback, resulting in a limited-edition lager called Russ's Revival -- named after the Michigan State University (MSU) researcher who resurrected the heirloom variety. 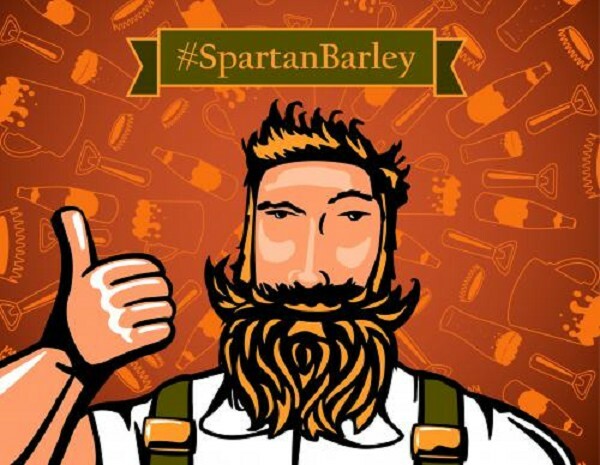 "When I heard about Spartan barley, it struck me as the perfect opportunity," said Steve "Bert" Bethel, brewmaster at New Holland Brewing Co. in Holland, Michigan. "This is a way to celebrate not just MSU and its contributions to agriculture but our whole state. When you hear the story behind Spartan barley, it's pretty difficult not to want to make a beer with that." Spartan barley was developed in 1916, four years before prohibition, by MSU plant breeder F.A. Spragg. Boasting superior quality, better disease resistance, and higher yields than its predecessors, Spartan quickly made its way into fields throughout the country. Brewers especially looked to Spartan as prohibition began to wane and production of beer with low alcohol content was legalized. By 1933, some 30,000 Michigan farmers were growing Spartan. Eventually, however, newer varieties were developed and Spartan had gradually disappeared from the agricultural landscape by the 1950s. But that's now changed, thanks to MSU AgBioResearch agronomist and plant breeder Russell "Russ" Freed and a team from the MSU Upper Peninsula Research and Extension Center (UPREC) in Chatham, Michigan, who revived the barley from heirloom seed. Joel Petersen, vice president of marketing for New Holland Brewing Co., said being the first to make a commitment to Spartan barley was an easy decision. He said MSU's agricultural expertise lends credibility to an endeavor that he just couldn't pass up. "This is an incredibly exciting project," Petersen said. "Here's a barley that was a substantial part of brewing culture a long time ago, and now we've had an opportunity to be part of bringing that back. The Michigan State program speaks for itself and is a leader in agriculture all over the world, so instantly there is a high level of credibility that made tackling this project an easy --yes." To revive Spartan, Freed reached out to colleagues at the U.S. Department of Agriculture National Small Grains Collection gene bank, a repository for plant genetic material and requested seeds. He planted and grew the first plot of Spartan barley in greenhouses on MSU's East Lansing campus. The UPREC team took seeds from that initial planting and continued to test it in Chatham and at the W.K. Kellogg Biological Station in Gull Lake, Michigan. "The whole barley movement, in general, has been really exciting to watch develop," said Ashley McFarland, UPREC coordinator. "It's great to see farmers get excited about a crop again, and Spartan, in particular, says a lot about our agricultural heritage here at MSU. If you look back 100 years to when Spartan was developed, MSU was an agricultural school, and now, today, we're still in touch with those roots." In his 20 years as a professional brewer, Berthel has always been one to look out for a good story and a way to support local agriculture. Four years ago, when he joined New Holland, he approached his new partners to make a commitment to use 100 percent Michigan ingredients. In April of this year, New Holland achieved that goal. A team at Pilot Malt House in Byron Center, Michigan, was responsible for turning Spartan's raw harvested grain, delivered to the malt house in massive bags weighing up to 1 ton, into beer-worthy malt. The first step in the malting process, called steeping, is when the grain is soaked in large vats of water for up to 52 hours. This raises the water content of the seeds to around 45 percent and initiates their growth process. Though most barley varieties take between three and four days to germinate, Spartan takes a bit longer. "Spartan has nice, plump kernels and good disease resistance, but as an heirloom, it doesn't have some of the advantages we get with modern cultivars," said Ryan Hamilton, maltster with Pilot Malt House. "It has higher protein levels than we'd like and it takes longer to germinate, but given its vintage, I'd say it's satisfactory." Spartan barley, once germinated, has a sweet aromatic scent of cucumber with a hint of watermelon. Hamilton said the true value of Spartan is not in its potential as a field crop, but in the return of its Michigan-adapted genome. "Michigan has a unique climate with special challenges that aren't always met by barley varieties bred for the Great Plains," he explained. "Our climate is wetter and cooler than it is out west, and that brings different disease, pest and weather conditions. The need for locally-adapted barley varieties has become more apparent every day, and the rebirth of Spartan is an important step in bringing that to our farmers." In the meantime, Berthel said he intends to turn the barley into the best-tasting beer he can. As a nod to Spartan's origins, Berthel is using the revived grain to produce a lager in the style of beers from the pre-Prohibition era. Using a blend of three hops varieties unique to Michigan, which trace their ancestry to Swedish immigrants from the mid-1880s, and a strain of yeast captured from the wild in Houghton County, the new brew will be as pure Michigan as Spartan's origins. Russ's Revival will be available in limited quantities at New Holland Brewing Co. and select tap houses throughout the Lansing area later this month. For more on Freed, his efforts to resurrect Spartan and his long career as a plant breeder, see the latest Ehmpressions of MSU podcast. Learn more about Spartan barley by reading "A Spartan Comeback of the Seed Kind" and our early look at its first year in the field.